This post is really intended to further my thinking on the ideas I introduced in my posts on Ethics and open data collection and Usage guidelines for researchers who use blogs. There are two aspects to the conversation that I want to talk about – the idea of public versus private, and the idea of vulnerable populations. Some research is exempt from REB review where protections are available by other means. This Policy allows the following exemptions from the requirement for REB review, as outlined below. the information is publicly accessible and there is no reasonable expectation of privacy. Direct quote (from Canadian TriCouncil Ethics Policy). Part of the challenge with illness blogs is that they tend to make what is traditionally very private information (individual health information) very public. This crossing of boundaries causes a lot of cognitive dissonance, especially in the health related research spaces. Physicians and health professionals are taught to keep patient data in utmost confidence. This is also the case with researchers. Researchers are typically taught to protect research participant data. We are taught that we must protect the confidentiality of research participants. The challenge comes when the patients/participants don’t want their data to be kept confidential. When they chose to self share information in very public spaces, the health care community and the research community suffer from a form of cognitive dissonance. They have what they see as very private data being found in very public spaces, but their training and their view on what is moral and ethical don’t allow them to share private data, even when that data is already shared publicly. When I asked the question about blogs being used for research purposes, some people thought the answer was simple – sure, the data is publicly available it should be OK with using it. What I struggled with was why I felt that to be an easy statement to make in the Educational Blog space but a difficult one in the breast cancer blog space. As an educational blogger I have no trouble with people using my blog for research purposes or quoting me in research as long as they attribute the quote to me. But the types of things I write about in my educational blog are typically not health related issues. They are typically things that are safe for ‘public’ conversations. The breast cancer blog is a different story. I want to know if researchers are using my blog. I want to know how they are using it and why they are using it. I also want to make sure that if they quote me the attribute that quote to me. I’ve chose to make what is very private a public conversation. That was my choice. In their assessment of the acceptable threshold of minimal risk, REBs have special ethical obligations to individuals or groups whose situation or circumstances make them vulnerable in the context of a specific research project, and to those who live with relatively high levels of risk on a daily basis. Their inclusion in research should not exacerbate their vulnerability (see Article 4.7). But why do I feel that it is fundamentally different to study the edu blogosphere than to study the breast cancer blogosphere? One of my committee members brought up the idea that perhaps the people involved in my study would be considered ‘a vulnerable population’. I actually don’t really see it. I’m studying the breast cancer blogosphere. Yes, some of the people who might participate in my study might be from ‘a vulnerable population’, but my study does not put them in a vulnerable place. However, I am studying with the context of a caring community, and I think the nature of a caring community is fundamentally different than the nature of an educational community. The Edu blogosphere is about sharing knowledge and making connections with other educators. We might make connections and become friends, but that does not make the edu blogosphere a caring community. The potential for caring within a community does not make it a caring community. The breast cancer blogosphere is largely about providing support for those who live with or care for someone living with breast cancer. Blogging through treatment is largely about providing a method of self-care as well as maintaining a connection to those who provide care (e.g. family and friends). So the community is fundamentally different, and I do think that somehow matters from a moral perspective, if not an ethical one. Do I think the breast cancer blogosphere is a public space? Yes I do. I think it is intentionally a public space. I think a lot of bloggers share their story publicly because they want their story to be heard. It is a form of testimony to the experiences they are having. Those who read blogs serve as witnesses to the experience. There are a lot of private spaces for people to blog (e.g. Caringbridge), such that those who want to write a journal and only share with their loved ones do not need to publish to a public space. So there is no expectation of privacy for anyone who is blogging, even if the topic is private. There is also the issue within research of maintaining a reasonable expectation of privacy among research participants. I had this debate with a lot of researchers (and a friend studying ethics at that). The challenge comes when the research participant does not want to be anonymous. When they have chose to make the private public, they may very well want their participation or the role acknowledged in the research. This is a challenge when acknowledging one person leads to disclosure of others – in that scenario you cannot acknowledge the one because you are putting the other at risk of being identified. Makes sense to me. But when that isn’t the case, then it makes sense to identify those who wish to be identified – or to allow them to chose their alias in the study reports. In the case of bloggers who are blogging publicly, if you agree that their blogs are a public act, and you wish to direct quote them then you are obligated to cite that quotation appropriately. If you don’t wish to identify any of your research participants, and they are bloggers, then you cannot direct quote them. You can only paraphrase what they say. This of course causes challenges with rigor – because you are now interpreting what they are saying without providing any direct evidence of what they said, and you are restating what they said likely without a way to validate that you interpreted it correctly. But that is kind of how interpretivist research works – all researchers are providing their interpretation of what they are studying. The only way to provide that proof is to direct quote, which in turn provides a means to directly identify the research participants. You see, a simple Google search or the direct quote will usually point you directly to the blog post in question. Direct quotes from blogs are inherently identifiable. BTW – this is true for tweets too. Tweets can be searched and identified. OK, so I have come back to the beginning. Yes, I do believe that public blogs (i.e. those without any form of password protection) are public spaces. I see the challenge when people are choosing to make the private public, as they do in the case of breast cancer blogs. Because breast cancer blogs are not just an educational community (community of inquiry), rather they are also a caring community. I do see an added need to think of them as more than just the text/blog, but rather to remember that there is a human being behind the text. It just feels different, and that difference needs to be honored in some way. I don’t think making breast cancer bloggers anonymous in research is appropriate. I think taking away the voice they tried so hard to reclaim through their blogs is a form of oppression. In the context of my study, I don’t think those participating in the breast cancer blogosphere are vulnerable populations in the way that the Canadian TriCouncil defines a vulnerable population. There is no material benefit from choosing to participate or choosing to not participate in my study. There is no way that my study furthers to oppress an oppressed population. So I fail to see that link. Ok, this post turned into a much longer musing than I intended it to. The big idea really happened at the beginning of this post – when I saw the connection between the private / public – and the way in which I believe it causes cognitive dissonance for health providers and researchers. Do you think that there is a difference between studying a caring community versus another type of community? 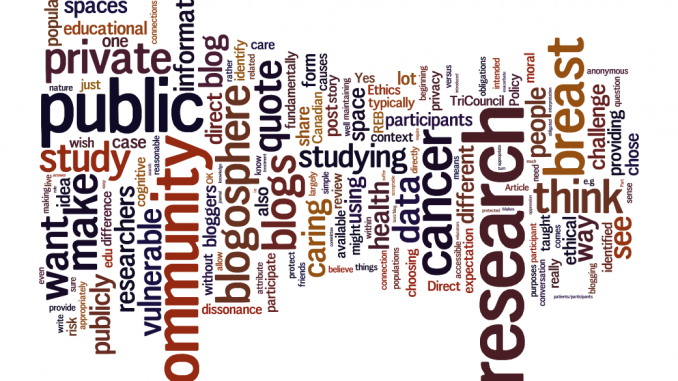 How does studying the breast cancer blogosphere differ from studying the edu blogosphere? How does that difference change our moral and ethical obligations?